Mark starts chapter 10 by bashing the Efficient Market Hypothesis (EMH). Since traders like him make a lot of money using price and volume information (amongst other things), then the theory must be flawed. 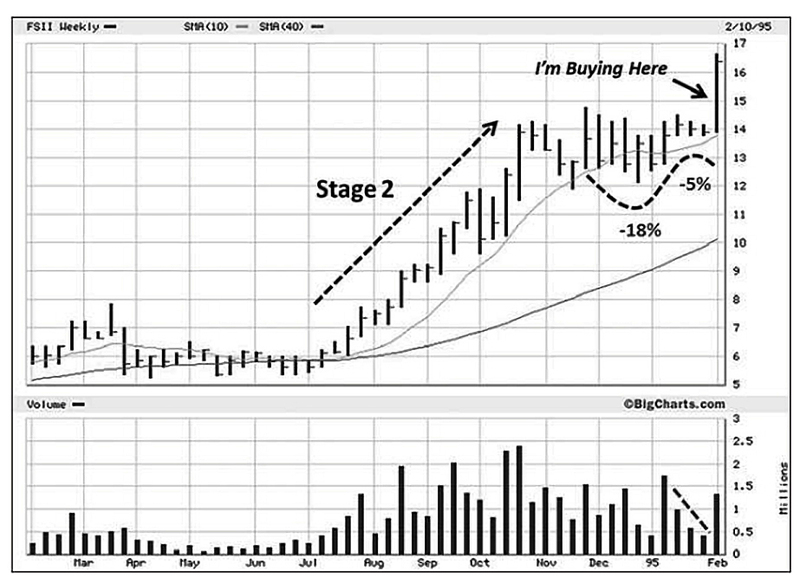 Most of those who subscribe to EMH have never made a living from stock trading. Perhaps EMH makes sense to those who cannot outperform the market; since they cannot do it, they believe it’s impossible. Chart patterns are old, predating the Depression of the 1930s, but they still work because they depend on human behaviour, which hasn’t changed that much. Ego, fear, greed, hope, ignorance, incompetence, overreaction,and a host of other human errors in reasoning and judgment create all sorts of discrepancies and in turn opportunity. My own trading relies on charting to the extent that I would never bet on my fundamental ideas alone without confirmation from price action. 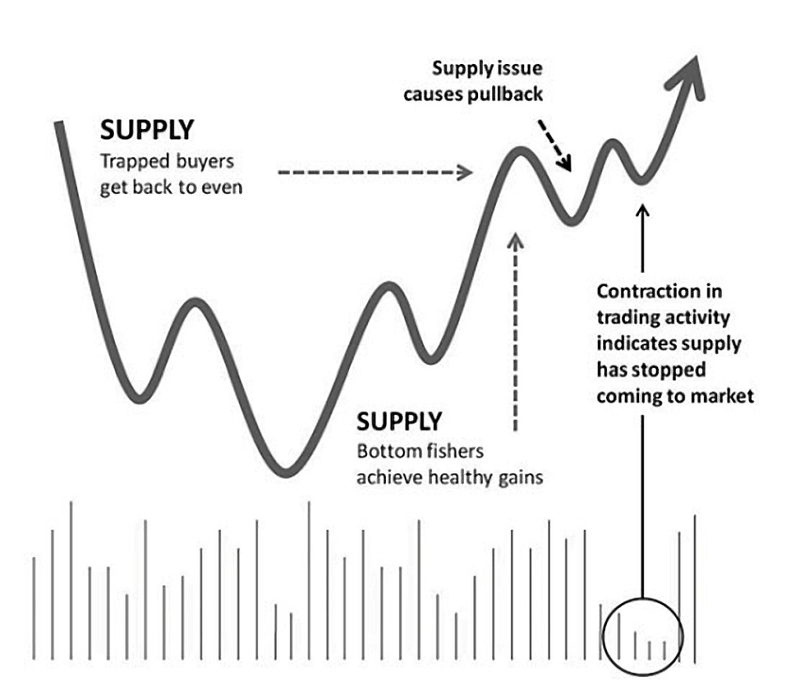 Mark sees charts as a map of supply and demand. He uses them to establish a stock’s trend, and to time his entries. He places himself in the central school of thought on charting. He uses both charts and fundamentals, rather than exclusively one of the other. I would put myself in the same group. The first thing Mark is looking for is the prevailing trend – up, down or sideways (Stage 1, 2, 3, or 4). 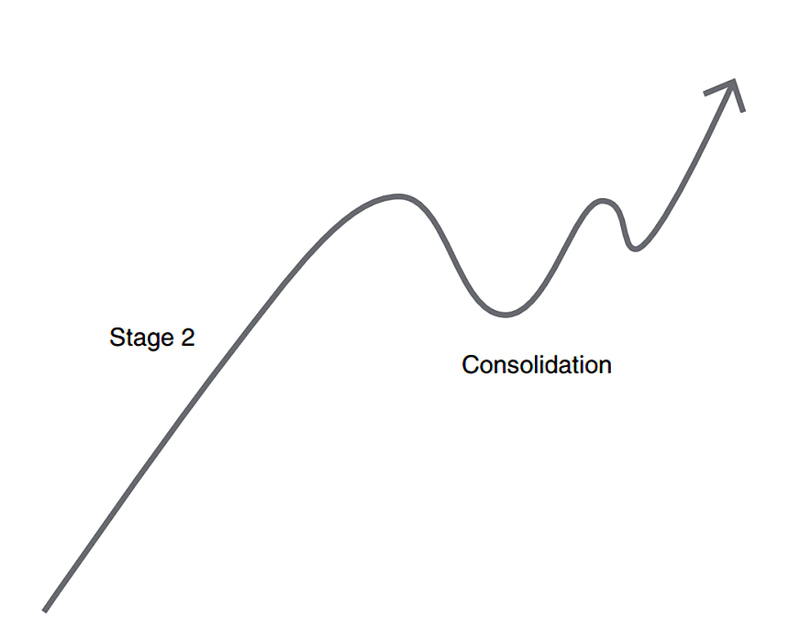 Assuming the trend is up (Stage 2) then the next thing to look for is a good entry point. He doesn’t want to be the first on board a stock, he’s looking instead for evidence of institutional buying. 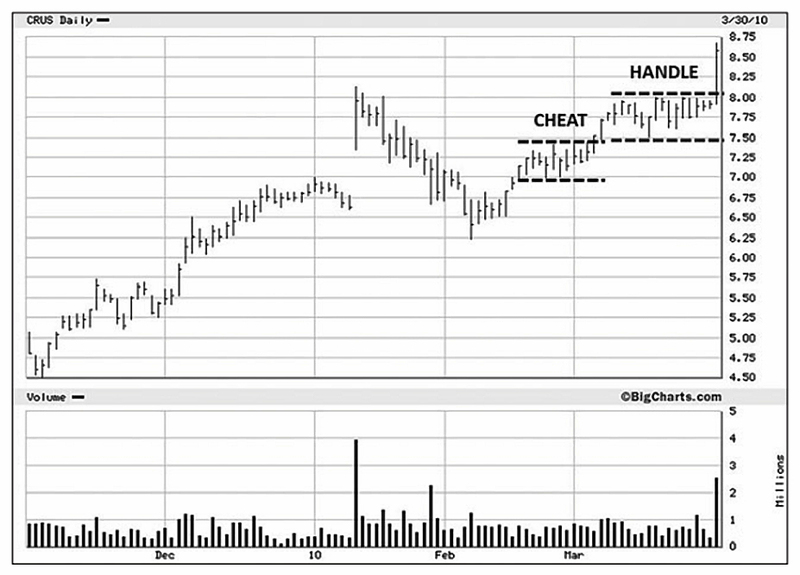 Mark looks for consolidations – pauses, or periods of profit-taking – in an uptrend. 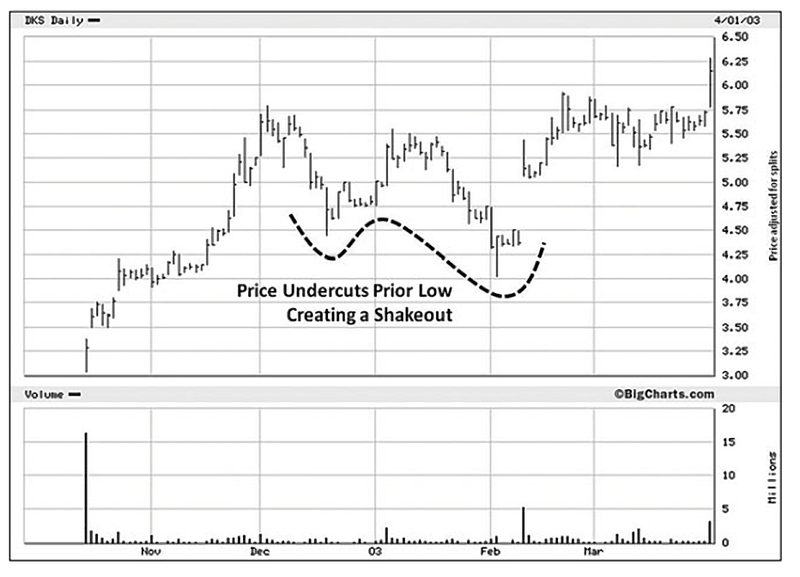 A “great base” is no use if it occurs in a downtrend. Mark only ever aims to go long Stage 2 and short Stage 4. A common characteristic of virtually all constructive price structures (those under accumulation) is a contraction of volatility accompanied by volume contraction. 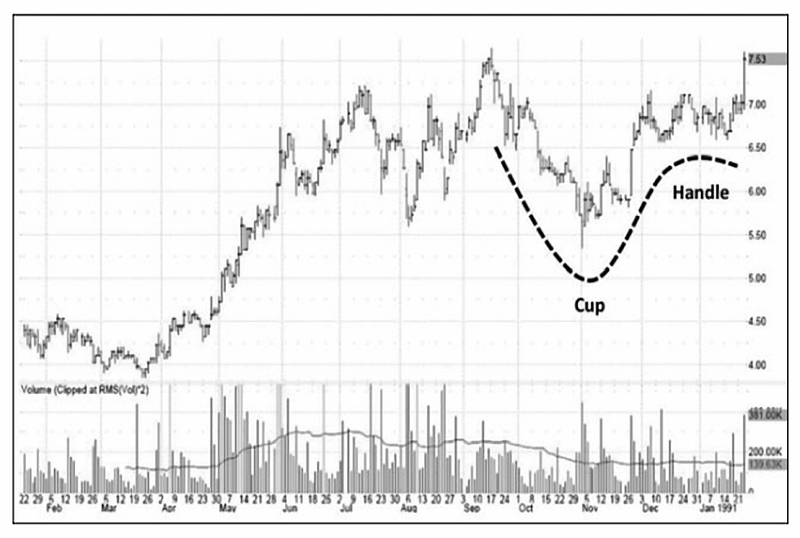 Mark uses the example of FSI, which was showing a classic cup & handle pattern. Over 10 weeks, FSI corrected 18% from its peak (to the bottom of the cup), then recovered to 5% in the handle. Mark bought as it broke above the high in the handle. 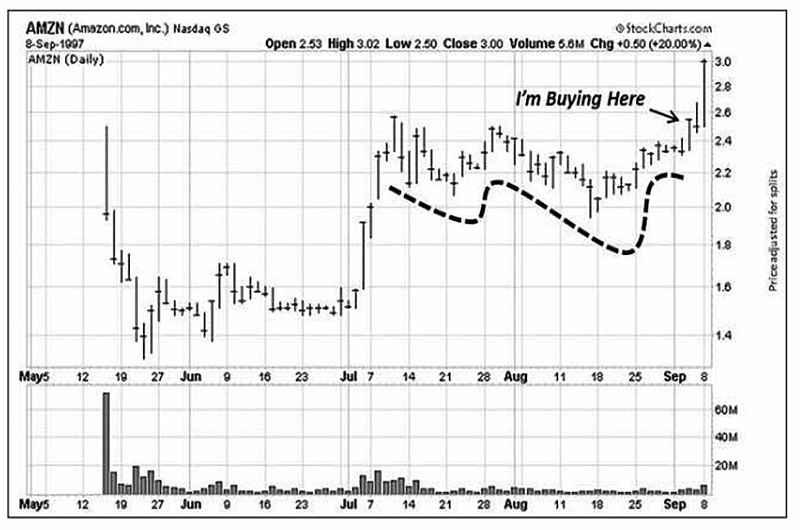 Mark calls this the pivot buy point, and he looks for expanding volume to accompany the breakout. A VCP can show between 2 and 6 contractions (though 2 to 4 is more common), with an initial fallback of up to 25%. Subsequent fallbacks should be smaller (15%, 8%) and be accompanied by a reduction in volume. Mark likes fallbacks to be somewhere around half of the preceding fall. 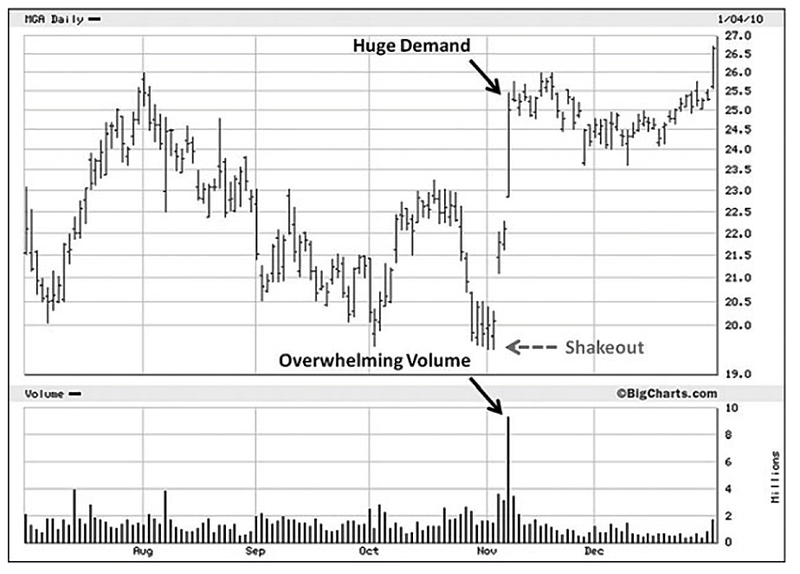 The smaller size and lower volume indicates that sellers are becoming scarcer. So Meridian here is a 40W 31/3 4T. 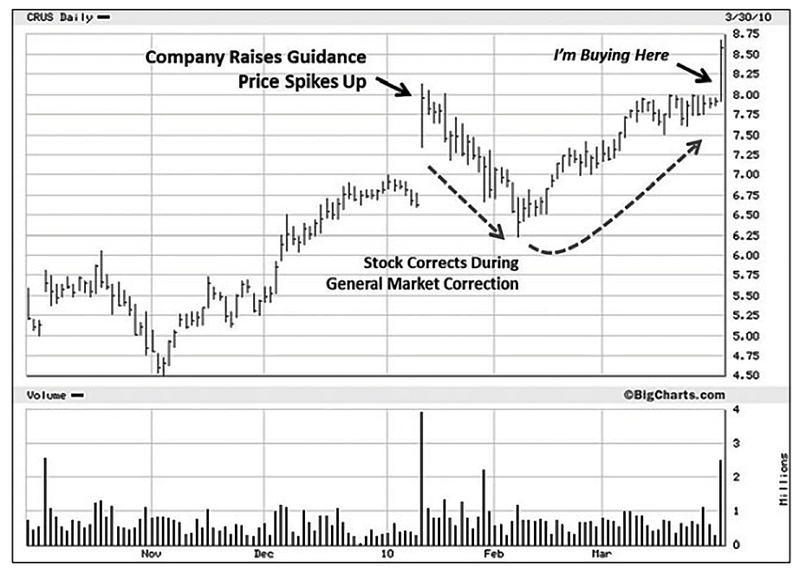 When a stock corrects, trapped buyers wait for a rally to sell into. They want to get out around their break even point. There’s also another set of buyers – the bottom fishers – who build up nice profits as the stock recovers from the bottom of the cup. They also want to sell near the old high price. 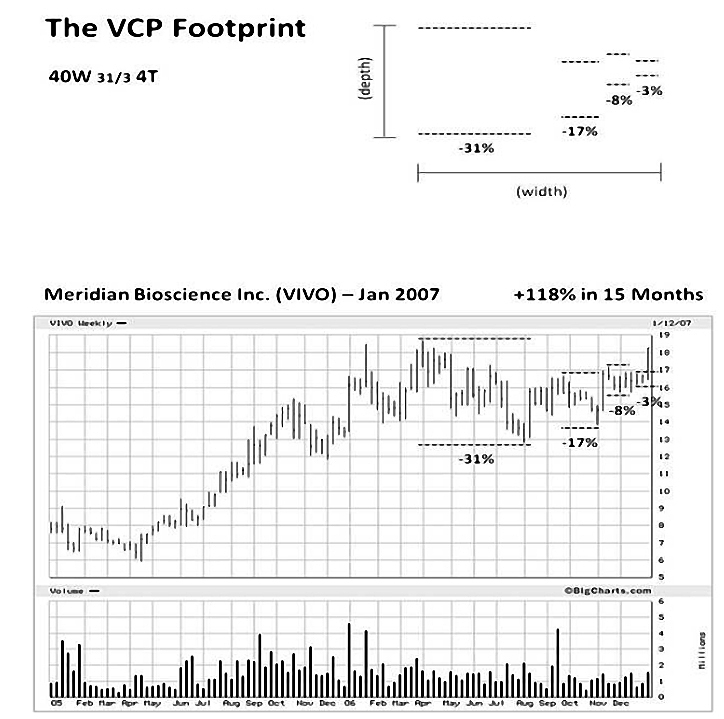 If there is institutional buying, it will absorb these sellers and pullbacks will become smaller (a VCP). 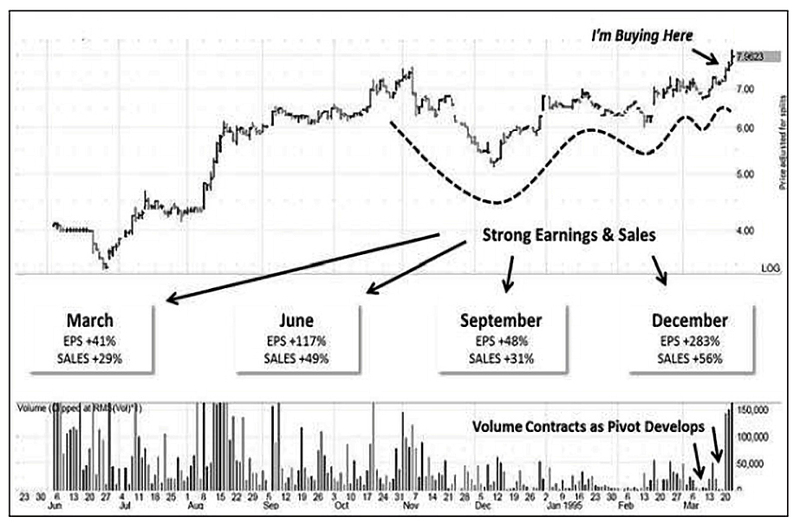 If the stock’s price and volume don’t quiet down on the right side of the consolidation, chances are that supply is still coming to market and the stock is too risky. For Mark, “buy low and sell high” doesn’t mean that you have to buy near the lowest price at which a stock has traded historically. Obviously, you have to buy at a price lower than the price at which you sell to make a profit. A stock making a new 52-week high could be a stellar performer in its infancy. A stock near its 52-week low has overhead supply and lacks momentum. 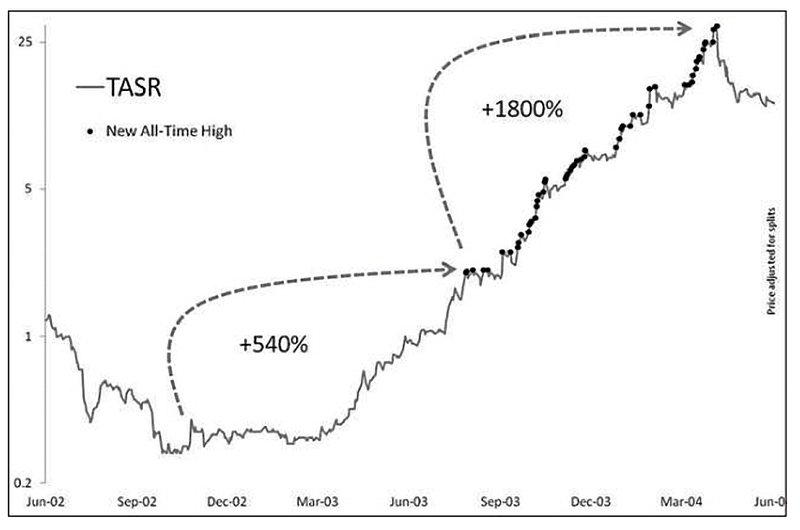 The only way a stock can become a super performer, is to make a series of new highs repeatedly, all the way up. You shouldn’t conclude that a stock is a bargain just because it’s trading down 50 or 60 percent off its high. During major bear market some names can decline by as much as 50% and still work out. I rarely buy a stock that has corrected 60%. 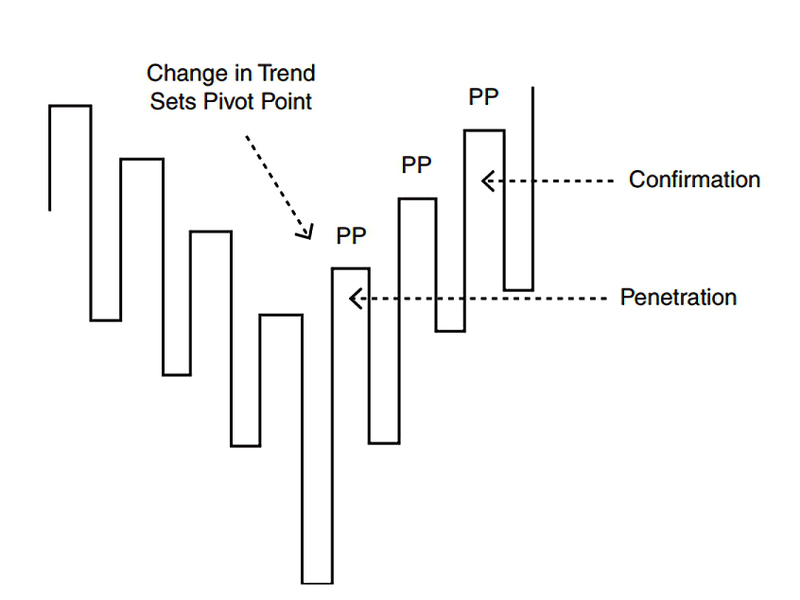 Most constructive set- ups correct between 10% and 35%. You will have more success if you concentrate on stocks that correct the least versus the ones that correct the most. Mark avoids stocks that rise again too quickly (V-shaped price action). Depending on the depth of the correction, a proper basing period can last anywhere from 3 weeks to as long as 65 weeks. Always include in your thinking that whatever you’re seeing in the marketplace is also visible to everyone else. If you put your stop in the obvious place (just below recent support), expect it to be hit. 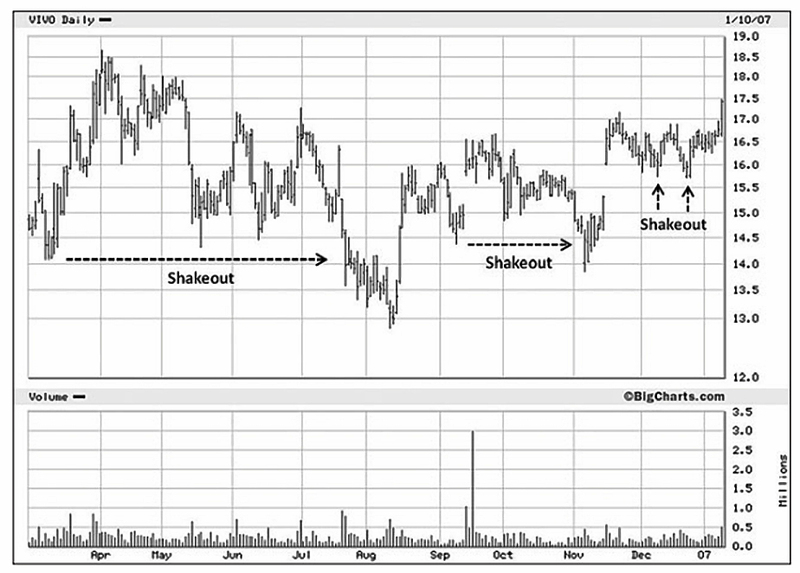 This is known as a shakeout or as “market makers shaking the tree”. 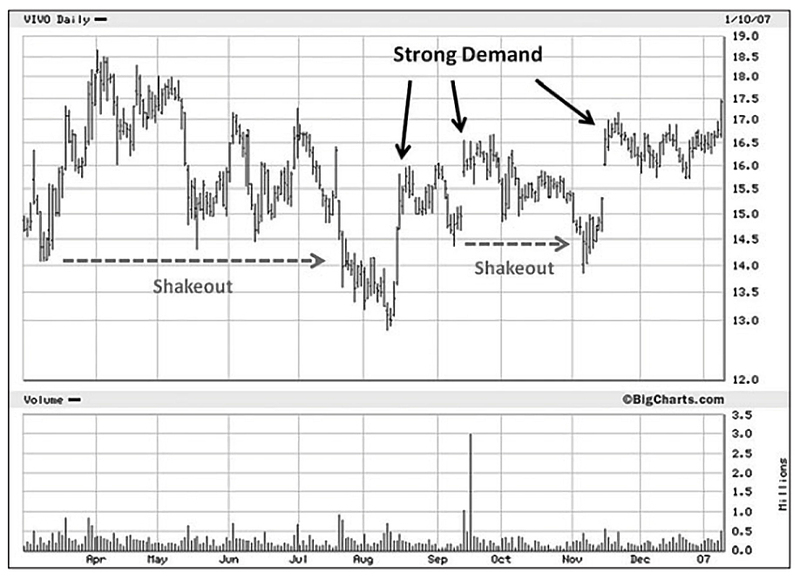 Instead, look for a shakeout or two in the base-building period. After the selling has slowed, Mark wants to see evidence of demand. A spike in price on overwhelming volume often indicates institutional buying, which is exactly what we’re looking for. 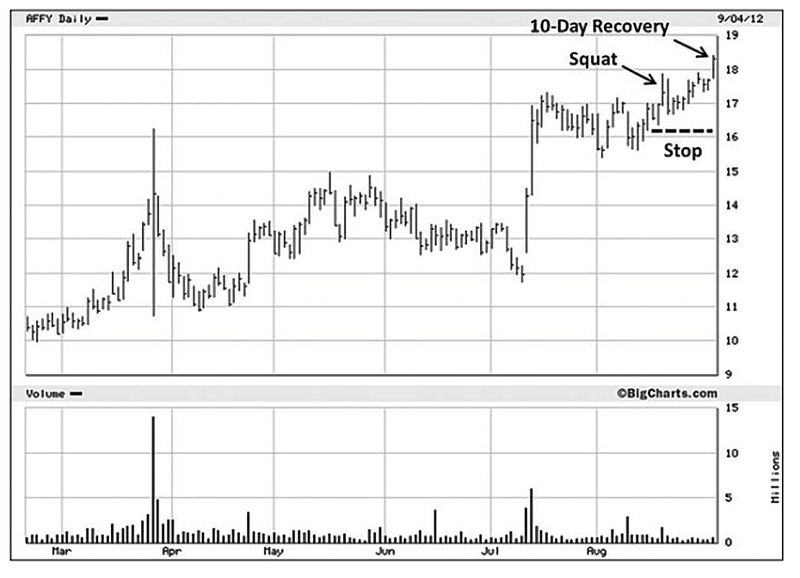 After a price shakeout, it’s a good sign if the stock rallies back on big volume, or shows price gaps. The volume must be much bigger on up days than on down days, and a few of the price spikes to the upside should be large, dwarfing the contractions. Sometimes a spike comes too early, leaving a stock vulnerable to a pullback along with the general market. As noted above, the pivot point is our buy indicator – the end of the final contraction and a new high on increased volume (after low volume). When the break out from the pivot fails, Mark calls this a squat. He doesn’t sell, but waits for a day or two to see if the stock will show a reversal recovery. 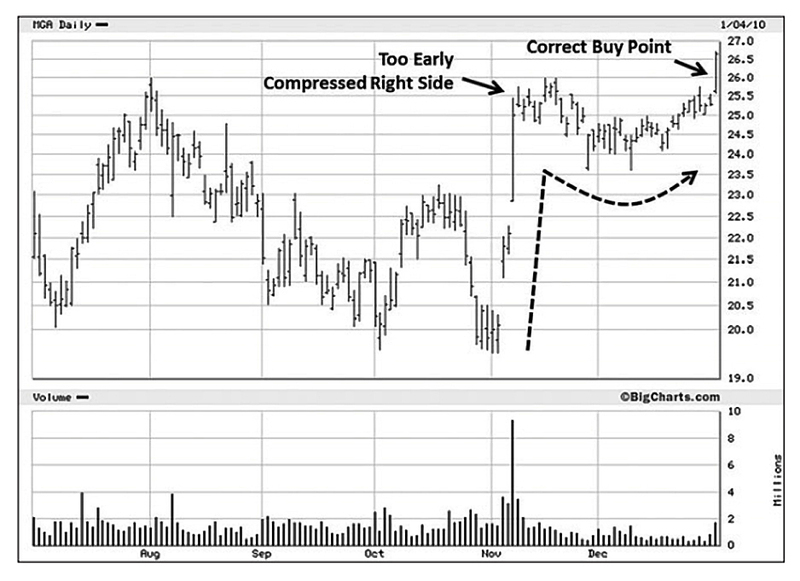 Mark won’t sell until his top is hit, or at least the price falls below the 20-day average. He also looks for wider up and down swings (a bad sign). And he advises that you ignore early in the day reversals from breakouts – wait and see where the stock closes. Mark does his research in the evenings, so that he isn’t distracted by he market. He uses a notebook, and has different notation for each of these elements. 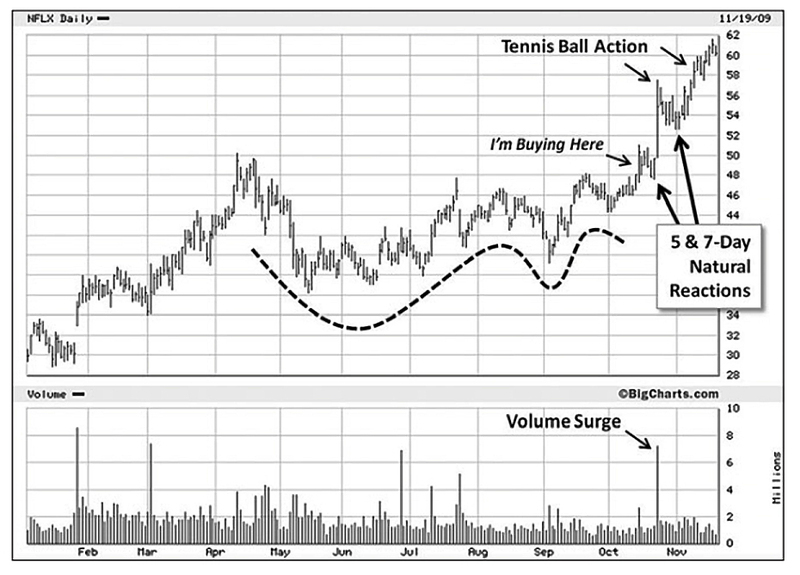 Bill Berger identified a positive form of post-breakout price action which he called tennis ball action. The price may fall below the pivot point, but as long as it recovers in a few days, everything is fine. Volume should go down during the pullback and recover as the price moves higher. Bill Jiler identified the saucer with platform patter in the 1960s. It later became known as the cup and handle. This pattern without a doubt is the most repeatable and reliable price structure among all the variations that superperformance stocks trace out before they advance dramatically in price. Sometimes the stock forms a 3C (cup completion cheat) pattern in the middle of the cup. Mark sometimes buys at the pseudo pivot point at the end of the cheat area. But I think that the rest of us would be better advised to wait for the real handle and the pivot point at the end of it. The real handle should form in the upper third of the cup, rather than the handle. 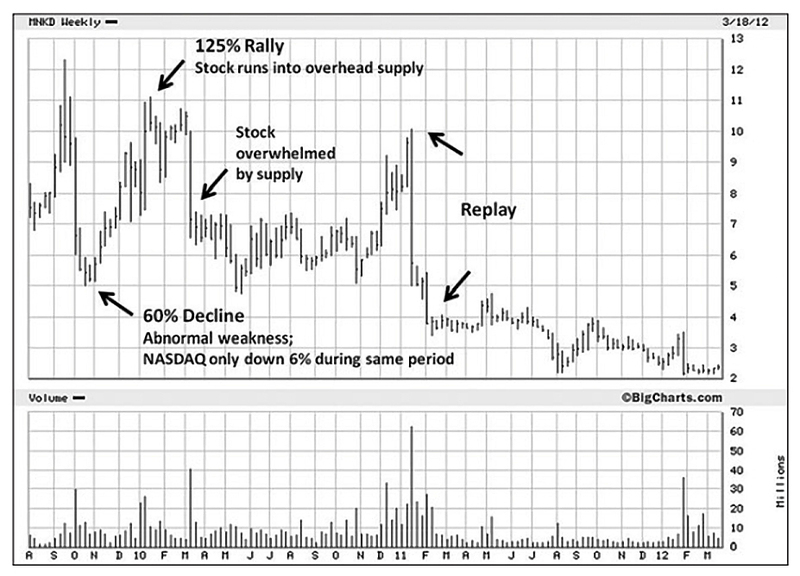 Jesse Livermore also had a system for buying when a downtrend turned into an uptrend. 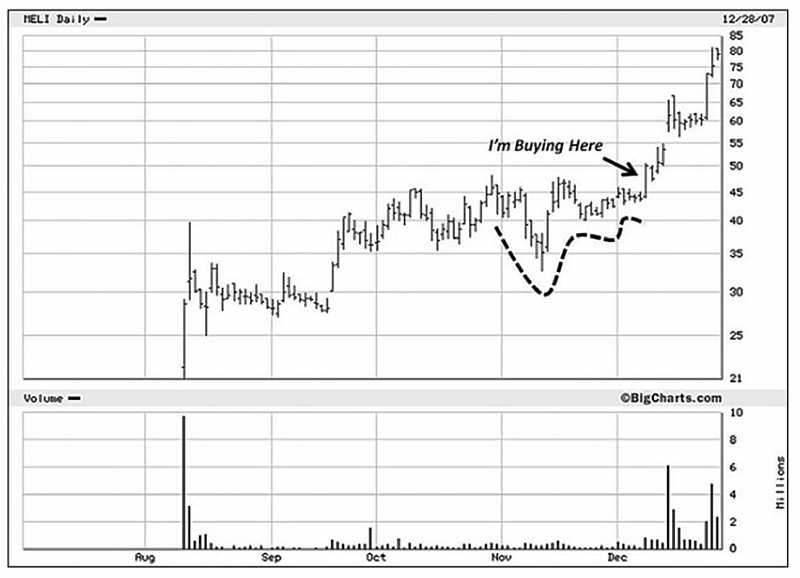 He waited for two pullbacks in the uptrend and bought when the stock traded above the second reaction high. Mark is particularly keen on new stocks (less than 10 years since IPO) which form what he call their primary base. This is the subject of chapter 11 (a short chapter) in his book. This will be a recognisable pattern to those of us who follow UK IPOs, particular on AIM. Many fall back within the first year or two, but a minority subsequently recover and do very well. Today’s chapters have been a bit lopsided – the one on charts is very long and that on primary bases is quite short. I found the charts very confusing on first reading, but second time around they seem much clearer. And the tip on IPOs that tank and recover confirms my own experience over the past few years. I’ll be back in a few weeks with the final two chapters of Mark’s book, which are about risk management. Some excellent stuff here, Mike. Thanks for distilling all this stuff. Appreciated by this reader.